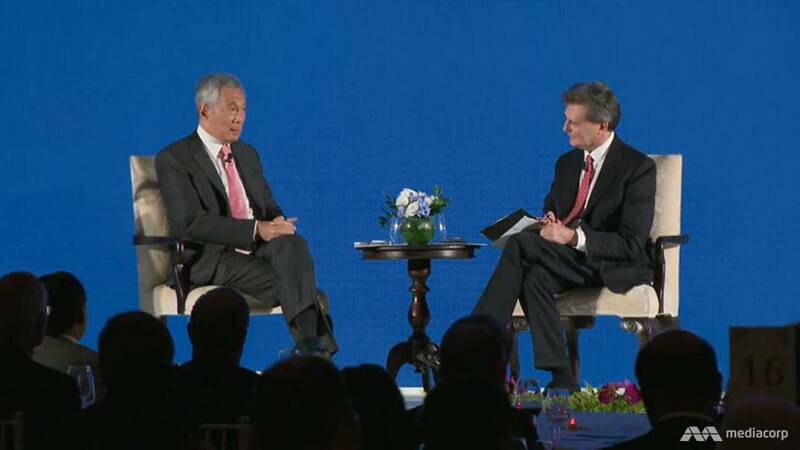 The trade conflict could result in “very strong stereotypes being formed”, which could have policy consequences, says prime minister Lee Hsien Loong at the Bloomberg New Economy Forum. If the current trade tensions between the United States and China are not well-tackled, it will lead to broader conflicts over investments, currency and “many other things” that could stoke “mutual suspicions and distrust”, said prime minister Lee Hsien Loong on Tuesday (November 6). He was speaking at a dialogue session during a welcome dinner for the inaugural Bloomberg New Economy Forum. The two-day forum is attended by more than 400 big names in politics and business. “The most apocalyptic view is that some Chinese will think that the Americans want to frustrate their emergence in the world to their rightful place, and some Americans will think that the Chinese want to supplant America’s role as the hyperpower,” Lee said. He added that while China may not necessarily be top on the minds of the American public, if the issues are not well handled, they could result in “very strong stereotypes being formed” of one another that could have policy consequences. Lee added that China’s impact on the world and their trading partners is “completely different” from what it used to be, pointing out that when China first joined the World Trade Organisation (WTO) 17 years ago, it made up about 4 per cent of the world’s GDP. That, he said, has now gone up to 15 per cent. To that end, he said that the terms on which China entered the WTO need to be brought up to date. When dialogue moderator and Bloomberg editor-in-chief John Micklethwait pointed out that Singapore has always played an “outsize role” in China’s development, Lee’s response was that he had overstated Singapore’s role. “They see us as a bonsai tree model of what China is,” he quipped, to laughs and applause from the audience. “What they are intrigued in is how it is possible in Singapore to have free and open elections regularly, multi-party politics, and one party remains in power for such a long time,” he added. In response to a question from Micklethwait about how governing Singapore has changed in his time as prime minister, Lee noted that the emergence of social media has made things “very different”, and the job has, he said, become “more complicated”. To that, Micklethwait asked if long-term strategic thinking has become harder for a politician. In light of tensions between the superpowers, the prime minister was also asked if closer alliances would begin to form between the various “slightly smaller” countries in the region. Lee said it would be “less than candid” to say that the regional bloc Asean of which Singapore is currently chair of is “impervious to gravitational and tidal forces”. He also stressed that neighbours are “never without complexities”, pointing out that even the United States and Canada have “interesting conversations” from time to time. “It is not surprising,” he said. “We have been born to be here. This is what God gave us… we don’t choose our neighbours, we have been blessed with two that are bigger than us, and we get on well with them,” Lee said, referring to Malaysia and Indonesia. “There will always be issues that will come up, and we will have to deal with them in a way which is constructive, win-win and respects the core interests of both countries,” he added. He also said that the different Asean members have different strategic perspectives, noting that for example, while China looms “very large” in Indochina, countries such as Vietnam are trying to maintain an independent position, while others like Cambodia and Laos see China as large sources of support and cooperation. As for Singapore, it has an interest in China’s prosperity and stability, as well as the region’s openness and security. “That depends on both China and the US,” he said. On the domestic front, Lee was also asked if Singapore could see a general election in 2019, the year that it marks the 200th anniversary of the founding of modern Singapore. In response, Lee said that it is “always possible”. When asked whether the “next generation of Lees” would be entering politics, the prime minister noted that none of his children have shown any interest in doing so.